Setup - Stainless steel tanks look good when they are in position. What about setting them up or moving them to another location at your farm. Not easy! Poly tanks are lighter and are easier to move. Each poly storage tank is supplied with built in lifting lugs to make them easy to move around. This means less foundation prep-work which leads to easier setup when you haven't got time to waste. Especially in spring, when your load of liquid fertilizer is arriving tomorrow. Durability - From your first glance stainless steel looks much stronger than poly. Because everyone knows that steel is strong right? Not in this case. Poly storage tanks have thicker side walls and are more flexible than stainless tanks. In fact, the average thickness of a poly storage tank is half an inch thicker than a fiberglass tank. This can make a huge difference. This allows the poly material to absorb an impact without getting damaged. That's why most poly storage tanks have double the manufacturer's warranty. Material - As a material, stainless steel and poly do not compare. It is a night and day difference. Although there are some stainless steel tanks on the market that do not rust, you are always at risk of making the wrong decision. One of the biggest causes of rust in stainless steel storage tanks is when fittings are added through the process of welding. Sperko Engineering Services has a great document that explains this well. They say that, "welds will frequently exhibit rusting along the edge of the welds. This is normal for welds that have not been properly cleaned after completion". If your storage tank continues to rust, the life of your tank will decrease rapidly. This has often led to unexpected cracks which can cause large leaks. To explain a solution for this is easy. Adding fittings to poly tanks is a seamless process. There is also no chance of rust or corrosion near the edges. To expand on these interesting facts, I thought you would be interested about an experience my friend had last year. This story is a great example of why it is important to research storage tanks before you make the final decision. A friend of mine was traveling through the states and he stumbled across a very interesting situation. Believe it or not, a stainless steel storage tank blew over in a windstorm. It had about 18" of liquid fertilizer in the bottom of it. It landed on a poly storage tank. The stainless steel tank was completely ruined, but the poly tank hardly had a scratch on it! He was impressed how tough these tanks are. Especially considering how much bigger the stainless tank is than the poly tank. 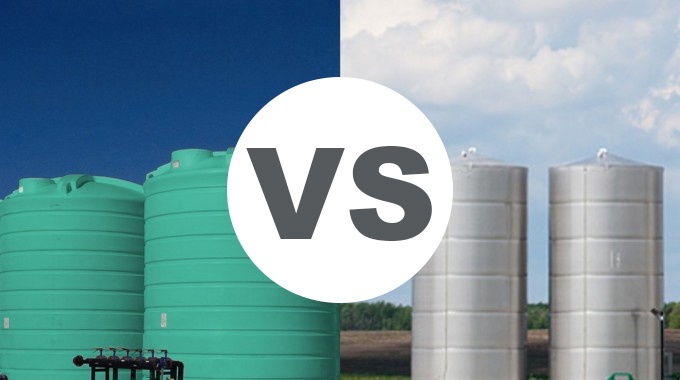 So, if you are looking for an efficient, cost-effective way to safely store your water or liquid fertilizer, I would definitely recommend you research the benefits of poly storage tanks. With the added savings and easy modifications, they are changing the way farmers view liquid storage. Trust me, liquid management has never been this safe!